A bill sitting in a New York State Assembly committee calls for limits to the number of patients a hospital nurse should assist on a shift. A newly-formed coalition is pressing a Buffalo-area Assemblyman to back the bill and get it on the floor for a vote. Members of the group, calling itself the Patient Safety Coalition, went door-to-door in neighborhoods throughout the Village of Kenmore on Monday morning. The village is represented in Albany by Assemblyman Robin Schimminger, who was urged by coalition members to "do the right thing." Cori Gambini, president of CWA 1168, speaks during a Monday morning news conference prior to the start of a door-to-door campaign in Kenmore. Supporters of a nursing "safe staffing" bill are urging Assemblyman Robin Schimminger, who represents Kenmore, to allow the bill out of committee and on to the Assembly floor for a vote. "We would never be calling out a particular Assemblyman. It's just not in healthcare workers' natures to do this sort of thing if it weren't desperate," said Sarah Buckley, Safe Staffer Campaign Coordinator for Communications Workers of America District One, a union representing local nurses. "Our situation is desperate." Advocates say medical errors are the third-leading cause of death in hospitals. Those errors, they say, are more likely in situations when too many patients are cared for by too few nurses. According to a 2002 statistic released by the Journal of the American Medical Association, the odds of a patient's death increases by seven percent for every additional patient a nurse must take on at one time. Assemblyman Schimminger released a written statement explaining his opposition to the "Safe Staffing" proposal. The statement reads: "First and foremost, I agree that the ability for nursing staff to effectively and efficiently care for their patients is of the upmost importance. Certainly, effective and appropriate staffing at our hospitals and nursing homes is critical to the delivery of quality care throughout the state. "However, current workforce shortages and projections that continue to demonstrate a wide discrepancy between the supply and demand of qualified nursing staff, especially upstate, and evidence of the negative impacts of such a one-size-fits-all mandate as shown by the outcomes in California, the only state with mandated nurse-patient staffing ratios, cause great concern. "Hospitals and nursing homes should be allowed the flexibility to develop staffing plans that are tailored to each individual patient and their needs. In addition, other factors may contribute more to improved patient outcomes, such as more advanced nurse education levels, the institution of multi-disciplinary care teams, and the use of evidence-based standardization of care." During a news conference prior to the launch of a neighborhood canvassing campaign, Reverend Kirk Laubenstein of the Coalition for Economic Justice urged Schimminger to "do the right thing," because it's what both his public and his political peers want. "Your constituents are calling on you to do the right thing, get this life-saving legislation out of committee and bring it to the floor," Laubenstein said. "With a hundred sponsors, you're going to say no, I'm going to hold it in my committee? Whose pocket are you in, Robin?" Members of the Council's Legislation Committee were told Tuesday of the problems of thinly-staffed hospitals and what it means for patients. 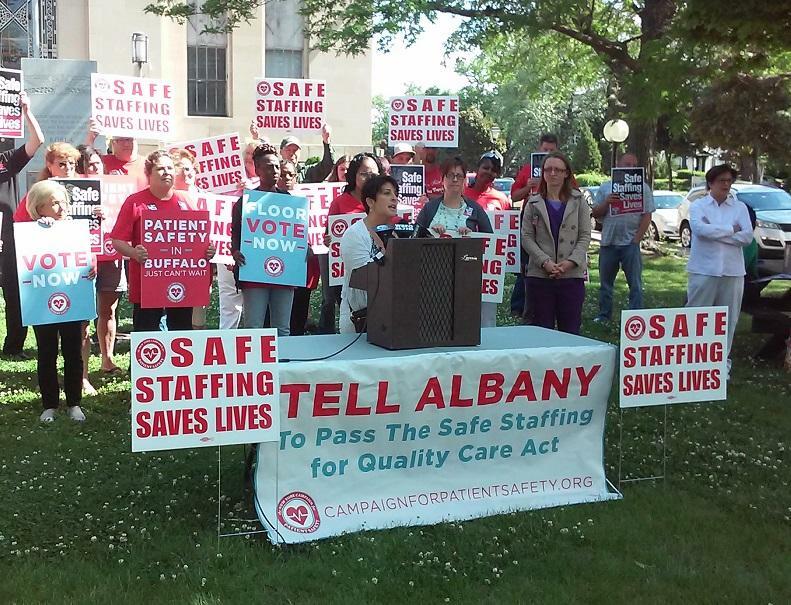 The session was part of a push for Albany to mandate staffing levels in hospitals and nursing homes.